We celebrate the Sacrament of Holy Communion on the first Sunday of every month and at other times throughout the year. All adults are invited to receive communion. 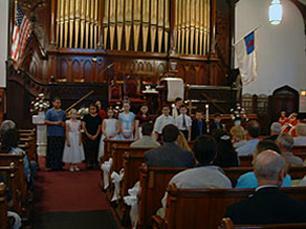 Children may receive communion at the discretion of their parents. On the Sunday following Labor Day, we celebrate Homecoming Sunday. On this day we gather to greet and to celebrate coming together for the Fall season. We have a brunch, and Sunday School begins. Near Thanksgiving, we participate in a Thanksgiving Service with the Ecumenical Community of Leominster and offer thanks for blessings received. On the First Sunday of Advent we have our annual Hanging of the Evergreens service. This service is a holiday favorite. 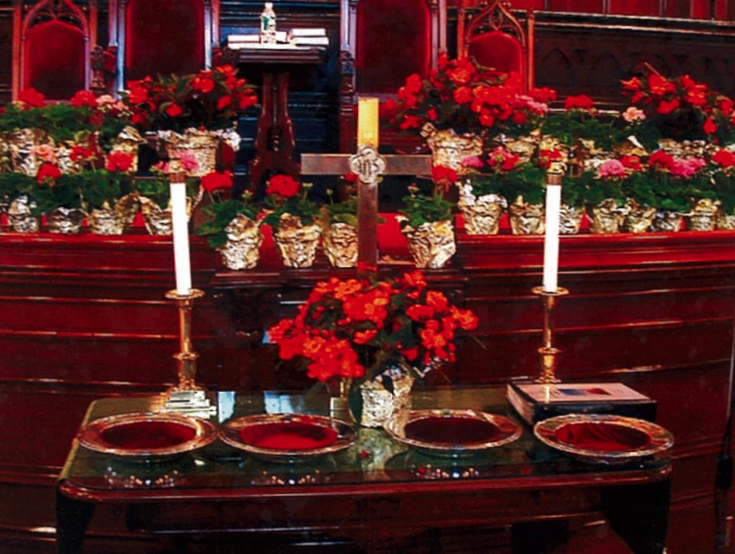 During this service, we decorate our sanctuary for the Advent and Christmas seasons. We have special holiday music and tell the story of traditional Christmas symbols as they relate to the birth of Jesus Christ. On the Second Sunday of Advent we have our Annual Sunday School Christmas Pageant. This is a favorite for people of all ages. 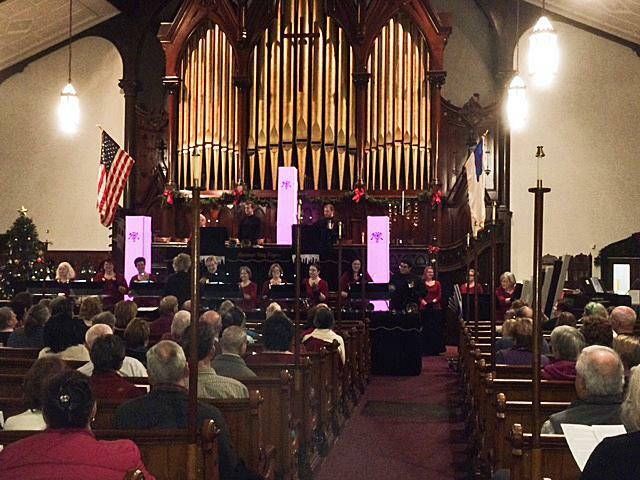 On the Third Sunday of Advent, we have a Christmas Cantata, or musical program. Our Organist and Choir will thrill you with glorious music of the season. 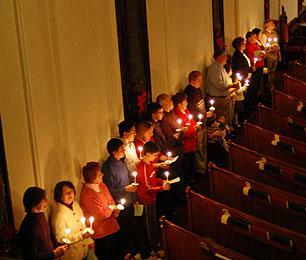 On Christmas Eve we offer a Candlelight Family Service with Communion at 5:00 PM which includes the Christmas Story and traditional seasonal music. Our Adult Choir sings, and we often have soloists Instruments and Readers. At this service we celebrate the Incarnation, the birth of Jesus Christ. On Ash Wednesday we gather at 7:00 PM in the sanctuary for a service of Word and memory for the beginning of Lent. Over the years we have developed this service into a source of healing where we are reminded that out of the ashes of our past comes the promise of new life and resurrection. On Palm/Passion Sunday we offer a service of the Word in our sanctuary which includes an Easter pageant, a dramatic reading of the Passion, and the distribution of palms. On Maundy Thursday we begin our devotions with a simple Agape meal at 6:30 PM, which is followed by a service of Holy Communion which commemorates the Last Supper of Jesus with his disciples and a service of Tenebrae (darkness) in which we recall the events in the final week of Jesus’ life. We begin Easter Sunday with a sunrise service at Apple Hill Farm in Leominster. Check the PCC calendar for time of service. At 9:30 AM we gather at the church and celebrate the glory of Easter with song and celebration. On the First Sunday in May we have a service of First Communion for those in our Sunday School program who have prepared for this important step in their faith journey. On the Third Sunday in May, we celebrate Confirmation Sunday. On this day, those who have completed our two year program are confirmed into full membership of the church. We use William Willimon’s course Making Disciples. In year one, students continue to learn about our faith. In year two, they are each matched with a spiritually mature adult mentor who continues to guide them in their spiritual journey. We offer a Service of Remembrance on the Sunday prior to Memorial Day. During this service, we share hymns, readings, stories, and prayers for departed loved ones. At the conclusion of the service, everyone is invited to come forward and light a candle in memory of those who abide forever in our hearts, heaven, and our sacred memory. The Blessing of the Animals is an ancient service of the church where we set aside a special time to bless the animals which make up such a big part of many of our lives. The Sacrament of Baptism takes place during public worship and is arranged through consultation with the pastor. New Members are received throughout the year after consultation with the pastor. Child care is provided throughout the year.